COUGAR TOWN is staging another FRIENDS reunion: Matthew Perry is set to appear on an upcoming episode of the Courteney Cox-led comedy, TBS announced. Who he’s playing and when he’ll show up is still TBA. Perry and Cox worked together earlier this year on Perry’s comedy, GO ON. Meanwhile, COUGAR TOWN has already played host to former FRIENDS stars Lisa Kudrow and Jennifer Aniston. 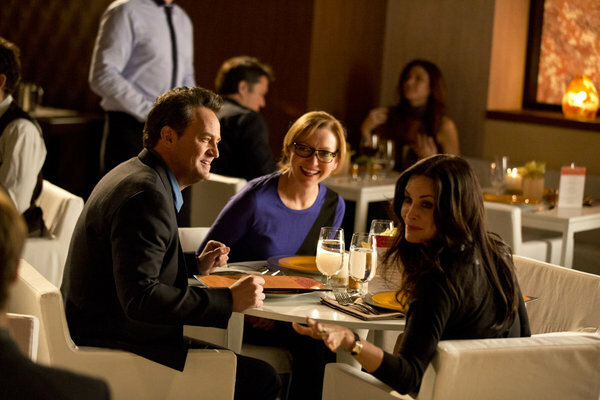 COUGAR TOWN’s fifth season kicks off Tuesday, January 7, 2014 at 10 PM on TBS. For GO ON creator Scott Silveri, one of his former TV gigs — as an executive producer of a little sitcom called FRIENDS — is still a constant presence in his life, thanks to Matthew Perry being a part of both shows. But in tonight’s brand new episode, the duo staged a larger reunion than normal when Courteney Cox (who played the Monica to Perry’s Chandler) dropped by to play a potential love interest to Ryan (Perry). COUGAR TOWN star (and former FRIENDS co-lead) Courteney Cox is coming to GO ON — and reuniting with her former TV hubby Matthew Perry. While we’ve shown you the first TV teaser for the episode, now we have some photos to go with it. GO ON may be off until Tuesday, April 2nd, but at least there’s something pretty epic to look forward to: the reunion between GO ON star Matthew Perry and his former FRIENDS wife, Courteney Cox.